The CF-2B is the work horse of the crewed fleet, carrying kerbals into LKO and ferrying to Deep Space Craft. This latest version has a reconfigured RCS system and the addition of an experiment module to carry important scientific data and samples back to Kerbin. The CF-2B has also been updated with additional models such as the CF-2BEnh, an enhanced version capable of longer missions with larger fuel reserves. 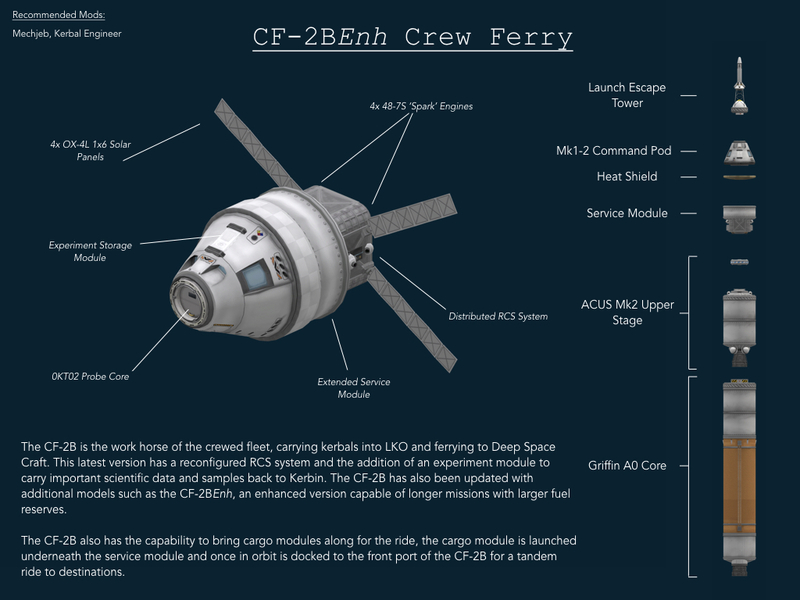 The CF-2B also has the capability to bring cargo modules along for the ride, the cargo module is launched underneath the service module and once in orbit is docked to the front port of the CF-2B for a tandem ride to destinations. A stock rocket called CF-2B Mk 3 Enh. Built with 142 of the finest parts, its root part is Mark1-2Pod.